The Patient Protection and Affordable Care Act, informally known as ObamaCare, is a step in the right direction. United States citizens deserve affordable, accessible health care. But like all medical insurance programs, it's a long way from perfect. ObamaCare often suffers from the same "gotcha" policies that have long gutted the protection of patients. We all believe that with medical insurance, we are protected against personal loss and suffering regarding issues from everyday medical snafus to catastrophic accidents or illnesses. Sadly, that is far from the case. With issues like balanced billing, treatment denials, forced drug substitutions, and outright fraud permeating the medical insurance industry, even top-of-the-heap insurance policies can leave patients in dire straits. From Medicare to the highest-end personal private insurance, insured patients are subject to some pretty ugly consequences stemming from some pretty ugly policies. And balanced billing is one of insurance's ugliest beasts. Balanced billing simply means that the health provider can collect whatever portion of the provider's bill that your insurance company does not pay on your behalf. This is not a co-pay or a deductible. It's the entire unpaid balance. Balanced billing laws vary from state to state. If, for example, you live in California, and are injured in an accident requiring emergency care somewhere other than in your own medical network, your insurance company and the medical providers must still abide by the network care agreements. That the emergency medical treatments were provided outside the network is irrelevant. If, on the other hand, you have that same accident in Arizona, the chances are that you will be slammed headfirst into a brick wall of insurance nightmares. Meet Jim. He lives in Arizona. Below is a picture of the motorcycle helmet Jim was wearing one fateful day in September of 2013. 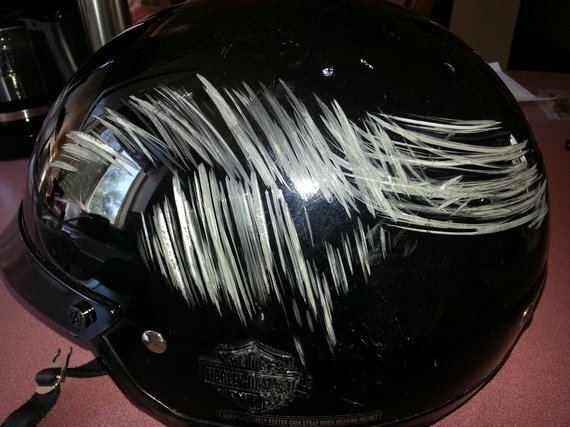 Thankfully, the helmet protected his head from what happened that day, but his body wasn't so fortunate. As Jim was traveling through an intersection, a woman who was inattentive behind the wheel of her vehicle plowed into him, then over him, leaving tire tread marks on his clothing, his body in life-threatened distress. She was found at fault and cited. She was not hurt. Jim was gravely injured and had to be airlifted to a trauma center for lifesaving measures. He survived, but not without months of treatment, rehabilitation and long-term, residual issues. He could not work. He had no vehicle. He received nothing for his pain and suffering or for his loss of wages. Why? Because Arizona law permits hospitals and care providers to balance bill the victims of an accident for all services rendered, even if that amount soars way beyond what they receive from insurance, or even if there is a settlement from the responsible party. And with vague language like "customary fees" written into the law, the law essentially allows health care providers to bill at the top end of their fee structure, leaving patients without recourse. Vehicle insurance paid off his motorcycle but did not provide funds for a new one. The woman's insurance company paid out the $100,000 maximum on her policy, but Jim ultimately learned, via a March of 2014 notice, that none of that money would go to him. He received a lien which states, in part, that the hospital: "...pursuant to the laws of the State of Arizona hereby claims a lien upon any and all causes of action, suits, claims, counter-claims, or demands for damages accruing to the patient named herein..."
In non legal-beagle talk, it simply means that the hospital gets the $100,000 settlement and Jim gets nothing. He cannot recoup his lost wages. He cannot get funds to buy a new vehicle. He gets nothing for the debilitation of his injuries. And this is after his own medical insurance already paid the health-care providers pursuant to his policy. It's not hard to make the case that Arizona's law is unconscionable. But it is their law, and similar laws, wholly or in part, exist in other states as well. The Kaiser Family Foundation provides examples, via a table of state-by-state balanced billing policies, which highlights the issues that fully-insured patients may find themselves subjected to. Balanced billing is a black scourge upon the insurance industry, but most state and federal lawmakers do little to protect the insured from this unbending practice. And the instances of balanced billing by health care providers from coast to coast, even in states that prohibit it, is far more commonplace than anyone even knows. Medicare bans balanced billing for providers who accept Medicare payments, yet even Medicare patients routinely receive "You Owe Us This Much More" bills in the mail, even when the debt is not truly owed. Those "nickel and dime" balanced billing debts, (wherein a patient is only charged a few dollars more than their actual co-pay), are routinely paid by the patient who doesn't take the time to calculate what his or her share really should be. Across the country, those seemingly insignificant amounts add up to billions of dollars in revenue that health care providers receive but are not entitled to. Then there are the providers who see a patient in the emergency room and ask the injured or ill patient to sign a document that states that the patient will pay the medical providers their full fee, regardless of what the insurance pays. This creates, in effect, a new contract that supersedes the insurance policy, and it changes everything for the patient. This practice should be outlawed. The mere idea that a patient, or family members of the patient, should be called upon in an emergency situation to read a contract about billing is unthinkable. And should the patient refuse, the care can also be refused. On more than one occasion, including the instance of a gentleman whose hand was injured in an accident, a California plastic surgeon made the judgment call that the patient's needs weren't an emergency and balanced billed for the full amount she believed she was owed. Such action exposes a potentially devastating gray area of California's balanced billing laws. Hers is a well-documented case of repeated balance billing, and a December, 2013 La Times article details the judgment handed down by a court of law in which the doctor was fined more than a half a million dollars and sentenced to five days in jail for her practices. She is appealing the sentencing. Yes, a sliced hand and the loss of a fingertip may not be the definition of life-threatening, but if the hand clearly needs repair and the fingertip can viably be reattached, should a doctor be able to declare that situation to be a non-emergency in order to balance bill? That fingertip isn't going to survive very long without reattachment, and I'm reasonably certain that the trauma to his hand felt like an emergency to the patient. Further, is a guy with a flayed hand and a missing a chunk of his finger, in a position to adequately judge what getting that that hand back to something close to normal will ultimately cost him, let alone read the fine print in whatever financial agreement might or might not be presented for his signature while in the ER? Doesn't common sense decree that anyone who is suffering will say, or sign, just about anything to stop the suffering, no matter what the consequences down the road may be? For anyone to take advantage of that immediate distress is just not okay. Medical facilities and health-care providers are entitled to compensation. No one is disputing that. But balanced billing is not the answer. The potential for abuse is blatantly apparent, even to a layperson. The mere concept that someone like Jim should be victimized again by a state law that by its very existence guarantees extended misery for victims of accidents caused by others, is appalling. Arizona, and every state with similar laws on the books, should be ashamed. If there is no humanity in law-making, there is no hope for victims. 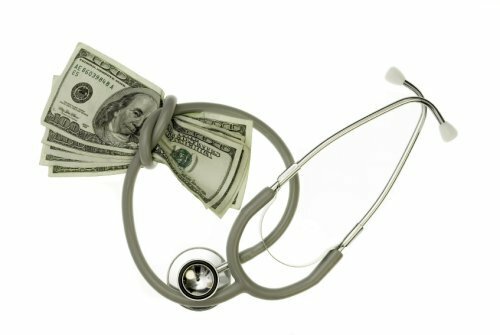 Odds are good that balanced billing has adversely affected someone you know, even if the affected person hasn't realized it. It's just so easy to pay a bill without first investigating it, especially if the overage being billed is small enough that we don't readily notice. We should all check our bills with an eagle eye and compare what should be paid with what the provider is asking us to pay. But if you live in a state like Arizona, you are going to need more than an eagle eye. You're going to need the power of the vote. You are going to have to be proactive and vote for leaders who pay more attention to their constituents than they do to powerful lobbies. A long time ago I lived in Arizona. I loved it. But back then, such laws didn't exist. Now, I wouldn't consider living in a state with such citizen-harmful laws on the books. We are all blissfully unaware of an issue until "it happens to me". That's unfortunate, because it keeps us from looking at the big picture when making life decisions. The truth is that when considering where to live in our great country we need to think about more than what the local climate has to offer. Health care costs are already over the moon, and a state government that allows victims of accidents to be denied the funds from a settlement to replace a destroyed vehicle or to recover lost wages, does not care enough about its people. Obamacare was created with the hope of getting the majority of Americans covered by health insurance. That's admirable and much needed. But honestly, what good is any health insurance if ultimately, as an accident victim, you can be denied even recouping lost wages, or be financially ruined by an astronomical balanced-billed amount for a procedure that restores health, whether or not that restoration was the result of an emergency? When receiving care at a hospital, patients should not have to ask: "Is that covered by my insurance?" But as it stands now, asking, and perhaps having to deny ourselves treatment based on the answer, is all we have to work with. Such are the policies being written by those with the power to do so, and in a great, civilized nation such as ours, that's a travesty. As a July, 2013 Becker's Hospital Review article shows, some hospitals make billions in profit. Yet they continue to charge huge fees for even the smallest of goods and services. We've all heard the stories of that $1,000 toothbrush on the hospital's itemized list, and sadly, it's not urban legend. It's real. And with medical costs spiraling out of control, patients are understandably leery, yet left with nowhere to turn. On the other hand, the issue is not cut and dried. Some hospitals barely break even or operate at a loss. And while hospitals and doctors bill their patients at ever-rising rates, that practice may be done in part to offset the care they must provide to those who can't pay at all. It's a vicious circle. But that viciousness should never be the problem of the insured patient. Insurance is defined in its simplest terms as "protection". But when balanced billing is permitted, protection fails. Balanced billing will never be the answer to the problem. The cost of medical insurance is not cheap, and with balanced billing running an end game around the parameters of insurance policies, people are getting hurt well beyond whatever initial accident or illness brought them to the hospital in the first place. Balanced billing is an ugly parasitic beast of the insurance industry. And like most parasites, it can do great harm... unless we choose to eradicate it.